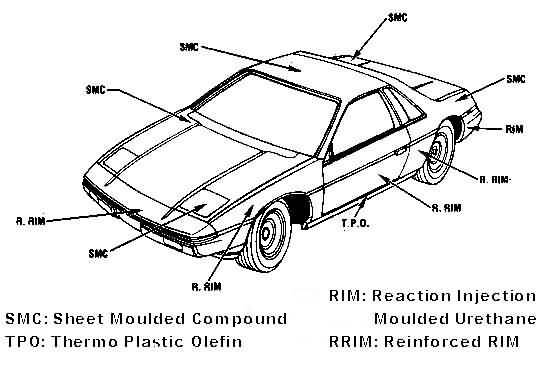 The revolutionary steel space-frame/plastic body construction of the Fiero required an equally unique manufacturing methodology. All the structural strength of the vehicle is in the steel stperstructure, with the plastic skins as a lightweight covering.. In fact, a Fiero chassis can be driven with ALL the body panels removed. The space frame consists of 273 separate steel stampings and 4300 welds. Each frame is built of 1- or 2-sided galvanized steel for corrosion protection. Those for structural areas are HSLA steel, High-Strength Low Alloy. Each set is carefully positioned in jigs and welded together in six major sub-assemblies; front and rear tubs, door rings, floorpan, and cowl/roof. These are later mounted onto a larger fixture for joining into the completed 600-pound space frame. Twenty- six Unimate robots welders perfrom about 40% of the 4300 welds. Doors (skinless) are then bolted in place and the space frame precisely clamped onto a fixture to pass through the giant 30-foot tall mill-and-drill machine. Small hollow, epoxy filled cubes are welded to each of the space frames 39 body-mounting points. Each cube is 1/2 inch high by about 3/4 inch square at the base. The doors are held accurately shut, and the frame's position is sensed and adjusted by variable differential transformers: LVDT. Then 39 drill bits, ranging in size from 5.2mm to 10.0mm, descend to cut quickly through the epoxy and more slowly through the steel. Tungsten-tipped milling inserts in the neck of each drill bit cut all 39 pads to an exact design height. A computerized panel-fit feedback system controls this. The whole process takes less than a minute - half the 30-car-per-hour line speed, an accuracy ends up at +-0.50mm. This machine was turning out 30 space frames an hour. Every space frame is exactly the same, regardless of option content. Because it is a generic structure, there are tremendous cost savings. All panel mounting points are located in exactly the same place after the space frame emerges from the mill-and -drill machine. As they emerge, each frame is dipped into an electrically charged primer called cathodic elpo uniprime. After dipping, it's never again drilled or pierced. It's a system that provides outstanding corrosion protection. The doors are then removed for access to the interior, and in go the wiring harnesses, steering column, shift cables, etc. Powertrain, suspension, wheels and tires are hoisted into place and bolted on from underneath. After that, other mechanical components get installed, working fluids added, wheels electronically balanced and aligned, and the resulting driveable chassis, whcih looks like an ugly dune buggy, is driven off the end of the line under its own power. Now mechanically complete, the chassis goes onto a dynamometer for power-train, electrical and brake tests before moving on to pick up its body skin. Any mechanical defects can be repaired before any further assemly is done. Body panels consist of five different varieties of reinforced com- posite plastic. More solid SMC is used for hood roof and rear quarters, while softer flexible RIM is used for front and rear facias. Each set of panels gets loaded onto a special carrier, which holds ir from below in exact car position. It's then painted in a state-of-the-art finishing system that eliminates variations in gloss and color on the different types of plactic. They get a layer of primer, a matte layer of color, and a top layer of glossy clearcoat. These are all high-solids acrylic enamel. All panels are painted simultaneously and not handles until they're unloaded for attachment to the car. At that time, doors complete with tracks, glass and window mechanisms are remounted to the space frame. All body panels are then fitted and bolted into place. Afterwards, the vehicle is water tested for leaks. With still no interior, it is a simple matter to get inside and track down water leaks and repair them. Interior installation is the final aspect of assembly. Seats, carpet, headliner, inner door panels, etc. - goes in, and the car is essentially finished. The car then goes through a final inspection, prior to being moved to the storage lot.